Rariya is an Abuja-based weekly newspaper in Hausa. 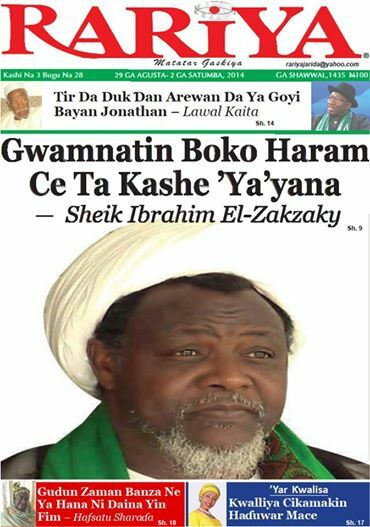 Recently, editorial team of the newspaper conducted a lengthy interview with Sheikh Zakzaky at his Gyellesu residence. The interview focused on mainly the Quds Day shooting, in addition to other related issues. Below is the translation of the interview to English by Ibrahim Usman. On Friday of the last month of Ramadan, Quds Day procession was observed all over the world. As it had been over the years in Nigeria, such procession had been observed on the invitation of the Islamic Movement in Nigeria led bySheikh Ibraheem El-Zakzaky. But this year’s procession ended up bloody. Soldiers opened fire shortly after the procession was terminated when the closing prayer was even said, which led to the death of 32, including 3 of Sheikh Zakzaky’s sons. Among the 40 people injured was also the Sheikh’s son. When the dust settled, a team from Rariya met Sheikh Zakzaky at his residence. After the condolence, the Sheikh, despite the not so good situation, granted an interview. What he said was outrageous, pathetic and excruciating. Let us begin with your daily life routine-how you conduct your daily affairs from the time you go to sleep to the next? Situation changes with time, but all things being equal I normally wake up 2 o’clock in the morning. Sometimes I wake up before then, sometimes after, and in some cases it could be sleepless nights. However, the tradition is that, I wake up 2 o’clock in the morning every day. I engage in prayers, supplications and other acts of worship from that time to Subhiprayer. After Subhi prayer, I also engage in Azkar till sunrise. After completion, and in the absence of any important event or emerging issue, I sleep to give back the lost sleep. I sleep for an hour or thirty minutes, as the case may be, and wake up 10 o’clock in the morning. This is followed by the normal chores, which I normally begin by 10 o’clock in the morning to 1 o’clock in the afternoon, while sometimes I begin from 4 o’clock in the afternoon to Maghrib (sun set). We normally conduct lessons twice daily, morning and evening. After the studies, I normally sit (with people) till Maghrib; everybody can see me at that time without exception. Whoever wants a special visit after Isha’i or before Zuhr, would have to give a prior notice. Visit before Maghrib is for everybody, but those with special cases might not receive the needed attention at that time. Visit at that time is meant for extending greetings. It has been established that, since the time you started the Quds Day procession it had been peaceful, and never recorded any violence. Nevertheless, of recent when the procession was conducted and terminated, soldiers shot at your followers including four of your children out of which three died. We have come all the way to condole you and get first-hand information from you on what actually happened and what action you intend to take, as against rumours and hearsay propagated by people and in the media. Expressing solidarity with the Palestinian cause, otherwise known as the International Quds Day is a global issue. If you search for ‘International Quds Day’ on the internet, you will see how it had been observed across the world over the years. Late Imam Khomeini (may Allah repose his soul) declared last Friday of every month of Ramadan as the day for expressing solidarity with the Palestinians and the oppressed across the world. It is therefore day of victory of the oppressed over the oppressor. This activity had been going on for years, it began when I was in prison custody. The last one conducted here in Zaria was the 23rd in the series. In the past, we used to gather in Zaria and observed the day two weeks after Eid, after which people would go back and observe it in their own localities. Lately, we decided to decentralize it, so that people observe it in their respective localities on the last Friday of Ramadan. In response to the global call of Imam Khomeini, this year we observed Quds Day in Nigeria in 22 cities. As it is the case all over the world, the occasion was not restricted to a particular organization or its members, but we have what we call Islamic Movement on whose invitation the procession was conducted. If you are invited for a programme in the name of a certain organization and you attended, that does not make you a member of the organization. For instance, if an Igbo invited you for a ceremony, the fact that you attended did not make you an Igbo. In the same vein, the fact that we called for an event did not make whoever answered the call as having the same views or belief with our own. Whoever answered the call has responded in order to express solidarity with the Palestinians and the oppressed against the oppressors. This is well understood in other parts of the world. In London, the procession included Muslims, Christians and even the Jews. Rabbis also participated. Some people came here with picture of a Rabbi whose car windscreen was smashed by opponents of Quds Day procession, because of his participation and rejection of the oppression on the Palestinians. It was the same case in New York; Muslims, Christians and Jews participated. It is very sad here in Nigeria that Quds Day had been described as a Shi’a event, or exclusive reserve of the Shi’a. I once heard this on the BBC, which describe last Friday (of Ramadan) as the day Shi’ites conduct procession in support of the Palestinian cause. This is outward foolishness, for this has nothing to do with faith or religion. That is how we understand it here. I could remember in the 90s, during the Quds Day procession in Sokoto, an Igbo man after reading the press release distributed, he joined the procession wearing his Cross. He said, he had realized that the procession was an agitation for human rights, and he was in support of rights of the people. Here in Zaria, the procession was attended by Christians, so also in Kaduna where two Pastors also participated. I therefore do not know why they relate it to an organization. The basic truth is that, we are not an organization, we did not form an organization. We however have what we call the Islamic Movement, it is like a centre; it called for the procession, and it was participated by not only its members but the general population. People decided to join on their own volition. In all these years we have been observing it (Quds Day), if you see anything amiss or contrary, know that it was outside the fold of the Islamic Movement. If you listened to the person who made remarks before the start of the procession in Zaria, he categorically stated that the procession was not exclusively a religious event. Religious rites have their mode of conduct, like in the case of prayer one begins with Takbir of intention and ends with Salaam (conclusion). This was why even the slogans were strictly tailored to reflect the purpose of the procession, solidarity with the Palestinians and condemnation of Israeli atrocities on the Palestinians. There was nothing outside this cardinal objective. The procession was conducted smoothly, with people on line up to the end where a closing prayer was said. Why did the soldiers opened fire when the procession had ended? The soldiers came when the procession was terminated. It was while conducting the closing prayer that the shooting was began on those who were at the tail end of the procession. If such ugly incidents happened during our processions, know that it was from outside our fold, and not within us. We had witnessed similar episodes, but not of this magnitude. For instance, in 1999 a plain clothe security operative shot dead one sister from Yawuri called A’isha, on her way back from the procession in Zaria. We know him by name. We later found out that, he was not a fully recruited security officer, but a retired soldier. Similarly in 2002, in ‘Yanmota, Kano, after the termination of the event when some people had even went to their homes, shooting was reported by the police. They killed 8 people, including a man in front of his house. It was during the first reign of (Governor) Kwankwaso. The same episode happened in 2009. The police came early morning and took positions at Kofar Doka. As the procession came, they were ordered to open fire. It was indeed a sporadic shooting. They killed one instantly, took one live and tortured him to death. This year’s killing was executed by the military, we had not experienced involvement of soldiers in our affairs. It was obvious that the soldiers came especially with the full intention to kill, because they started shooting the moment they came, without any warning. They also had in mind those they targeted to kill. This was the first time soldiers came with the intent to kill. Whatever contrary information you heard, was not from within us. What we know and used to do was to begin (procession) from one (identified) end and terminate at the other; people return to their various destinations. Those who wished to go back to their destinations on time that day, parked their vehicles at strategic places, and after the procession trekked while others took commercial transport to those place where their vehicles were parked and went home. That was how we used to do over the years (it remained the tradition). Was it one soldier that fired? It was soldiers, not one, with reinforcement. They came from another place. Some of them might have come from Abuja, others from Borno. I do not have full information from where all of them came from. Some of them were reported to have spent 7 hours coming here without a stopover, with Zaria as their final destination. Those from Borno stopped over at Kano (to monitor the procession there), while those from Abuja came to Kaduna. They came purposely to kill, their target was not only the Quds Day procession, but to detonate bombs in the city and engage in house to house killings. From all indication, some people were privy to the plan. This was why they stopped the annual Eid durbar. From all indications, the Emirate knew this before hand, that was why the stopped durbar. They knew there would be killings. They anticipated worse than what they did. From that time, what was the response on the part of government or on your part? From the look of things, they had wanted to continue with the killings. We knew this, but what we were then busy demanding the corpses our dead how to bury them. At first they refused to hand over the corpses, that we should receive them one after the other, as according to them we might revolt during the burial. In the end, they handed over the corpses to us, and we took three consecutive days burying our dead. The first day we wanted to conduct the funeral prayer was Saturday, they went to Hussainiyyah where the corpses were kept and killed more people, and many were injured. One of the injured had his arm amputated. Yet we buried 17 on Saturday, on Sunday we buried 12 and on Monday we buried 3, the three of my children killed. All in all, we buried total of 32, the 33rd was the Igbo elderly man killed who was handed over to his relative. He told them to inform us of the burial so that we send our representatives. You could see that the killers were still thirsty for more blood. They thought there would be demonstrations, so that they would kill more people indiscriminately. They could set a place on fire or shot at some people and attribute it to those who staged the demonstration. They could even attack a military barrack, and describe it as a vengeance mission. It was in the line of actualizing this objective they sponsored a newspaper which went outside the ethics of professionalism, published that I retracted from my call for calm. It stated that, even if I did not change from that statement, there are my supporters who would not change; and that I do not have control over them. They however gave themselves away by releasing an information that we knew could only be exclusively known to the government. It said, the Islamic Republic of Iran had expressed concern over the killings, and had summoned the Nigerian ambassador in Iran, who in turn said the issue would be investigated. We did not know that some world governments have expressed concern over what happened to us. The paper listed Lebanon, Turkey, Bolivia, South Africa, Peru and Venezuela among countries that expressed concern. We then realized their foolhardiness, as this information could only have come from the government. According to them, we were conniving with these countries to cause trouble in Nigeria. You can see that, they wanted to use this to unleash further violence, Allah will never allow them to achieve their objective. We know what was done to us, and who killed us. It is therefore irrational on our side to fight the innocent people. We know the killers, and we know what they did was brutal and madness, but we are not also going to engage in brutality and madness (as they did). We are going to take a different form of vengeance. We have an Avenger, Who who will avenge for us, and He will surely take vengeance, very soon. I know they don’t know Him, but they will surely see His work. May we know the history of the Islamic Movement since inception, the successes recorded and challenges? It is a long story indeed. This Movement had its root from the late 70s, when we were university students. I was then a student at the Ahmadu Bello University from 1976 to 1979. Socialism and Communism were then the order of the day, which some people regarded as the befitting future of this country. There were also those agitating to maintain the status quo. We that came from religious background knew what they were not fully aware of religious issues. In essence, Communism was based on deep-rooted hatred for religion; the system did not recognized the existence of religion. While we were calling for return to religion as the best system of governance for salvaging the society on one hand, others were opposing religions as backwardness. They were trying to draw the society backwards they were wrongly equating Islam with the actions of past kings and dynasties (of Muslims) as the true Islam. Islam is a message, and should one act contrary to the message, all you need to do is to compare it with the actual message. If one acted contrary to the message, it is not the fault of the message, but that of he who went contrary to it. They promoted the faults of other people and ascribed it to Islam, thereby giving Islam a bad name. We stood against this notion, because if a person committed armed robbery, what he did should not be ascribed to his religion. His religion is different from his action (robbery). In essence we were advocating for religion as the only future and salvation of the society. While this was going on, there came the Islamic revolution in Iran in late 70s. This added to our hope that, what we were agitating could be realized in our own time. Some people believed that Islam had played vital role in history, but it had gone away with time and cannot be applicable now. They were proved wrong when in this era of advancement, an Islamic Republic was established in a particular country. For that reason, our support and allegiance was directed at the leader and mastermind of the revolution, Ayatullah Komeini (may Allah repose his gentle soul). He became a model to us, as before then we were leaning on similar personality, Sheikh Bin Fodiyo. They were telling us that, the era of Bin Fodiyo was an outdated era of horses as means of transport. Now here is Islam established in the era of aeroplanes as means of transport, what is the difference? Any good observer of our activities will know of our constant mention of Bin Fodio. We have at least 100 schools, all named after Bin Fodio. The schools are at primary and secondary levels, all called Fudiyyah. We are yet to establish a university. We are on the way, God’s willing we will be there. When we started (the struggle) in the 70s and 80s, they were calling us ‘Students’. By the end of the 70s, the ‘Students’ have completed their studies and have gone home; some have secured jobs. From then onward, the issue was extended to towns and cities. By the end of 80s, the issue took a new dimension beyond the circle of students and workers, into the wider populace and villages. The issue continued expanding in the 90s, as can be seen now in the 20s. It has now become a mass movement that cut across regional boundaries. We have reached a stage when the Movement has gone beyond religious entities in which Christians are now becoming part and parcel of the Movement. We are presently considering creating a forum of Christians of the Movement. They are Christians, yet they believe in what we are calling for. While aligning with us, when it is time for prayers, they move aside (but united in the cardinal objective of the Movement). Whether one believes it or not, the Movement has become a mass movement involving millions of people with full conviction of objectives of the Movement. There are people whose support is not open yet, but they sympathize (with us). They cannot outwardly declare their support, but are secret supporters with internal conviction. Among those who declared their support are the soldiers, they conduct study sessions in the barracks, as it is being done in other places. This is no secret, the military is fully aware of it. This is why such people were not involved in the military atrocities being committed, for they would not do it. This is a Movement that never supports injustice, we are behind whoever is oppressed and wherever he may be. Since the revolution by Sheikh Bin Fodio in the Hausa Land, there had been several attempts by groups aimed at yet another revolution. Yet there was never a scholar who, either through his followers or teachings, had impacted positively towards another revolution. Why has this been so to this time? For those who had made attempts in the recent past, may Allah reward them. Know that, situation allows for the actualization of certain issues and events. When the White man came to this land, some tried to chase and dislodge him, but the situation did not warrant that. As the Whiteman went on establishing his ideas, some people stood firm against it, but the prevailing situation did not provide them the opportunity to make any impact. If you look closely, our present era is entirely different. We are completely engulfed the in the ways and ideas of the Whiteman, as such our vision and ideas too came from the hub of the Whiteman’s ideas (the university), where he least expected. We visited a certain Islamic scholar in Jalingo sometime ago, now late. He wondered how we came about this Movement, and I told him it is Da’awah, anyone could do it. He said, he could not do it, and even if he would could, people would not listen to him. He said this to me: “They will listen to you, because you know their secret so well; they know you and you know them. The moment you talk they know what you are talking about”. You can see that, this scholar had since realized that the struggle had emerged from a place where nothing could be hidden from us. They know we know, may be even better than them. So you can see how the situation has changed. Years ago, I told someone that, had my age reached 70 (when I was talking to him), I could not have done done this. In addition, injustice is waxing stronger and people are becoming more aware. Things are happening, peoples’ brains are opening up to realization (of events and awareness). For long we have been talking while people were not understanding. What happened now has opened the people’s eyes, and have realized what we have been saying was the truth. What have you been saying that has now become truth manifest? Over times, we have been saying that the Government is the real Boko Haram, and that what is happening is a well calculated plan to annihilate Islam and Muslims’ strength. It is beyond comprehension how over night there emerged a Muslims group with the sole intent of establishing an Islamic government, but went about detonating bombs in mosques, churches, market places and motor parks. Yet, it wants to establish an Islamic government! This is nothing but ridiculing Islam. This is the handiwork of the government, as the group had remained faceless and unknown. People are at loss. On our part, we have seen Boko Haram (with our own eyes); they came in broad daylight with their Boko Haram brand of vehicles, and in full Boko Haram (military) uniform. Among those they killed were genius students, my sons undergoing studies in the best universities in the world. If not Boko Haram, who would have shot dead a student about to complete his studies in Pharmacy. They not only shot him, but crushed his stomach and stabbed him several time with knives. There was also a student of aeronautics, the study of how to construct an aeroplane (not only to fly it, but to construct it). They pierced a knife deep into his genius brain! They were unmasked in broad daylight. Before they killed these youngsters, they told them that they were the killers of people in Borno, and ate the raw meat (of the dead). I thought of where they would have come from, to have spent 7 hours in a non-stop journey to Zaria. I realized that, they must have come from Borno. This had opened the people’s eyes the more. They have come to realize that, it is a war on Islam. It is not only happening here, it is the same situation worldwide. This is carefully planned action to eradicate and wipe out anything related to our history, politics and culture. If you observe carefully in all the countries similar episode is taking place, they demolished structures and buildings that symbolized our history and culture, including a structure that had been in existence for over thousand years. Wherever they went, they destroyed good things (artifacts). This is their intention here, but Allah will never allow them to succeed. Right from inception of your struggle you were branded as trouble-makers. However, the trouble was yet to be seen from your side, but elsewhere and it has today engulfed the whole country. What can you say on the insecurity being experienced? We are calling on people with matured minds and conscience, so that they understand what we are agitating for. By conscience and rationale, we mean not the use of physical strength, for strenghth does not instill an idea into the mind. Our aim is to instill in the minds (of people) an idea that the mind can easily capture with full conviction. When you are under the threat of a gun, and you are forced to accept an idea, you will not actually agree and comprehend the message. This is why our call is fast spreading and waxing stronger, because they could not present a contrary rationale message, but rather resorted to the use of force and madness. Force has never triumphed over rationality. I read a research conducted by the United States in which it wanted to translate true narration of religion (Islam) that would conform to their views. They categorized Muslims into three groups: the orthodox, the moderate and the radical or hard line views. They said all the groups should not be taken for granted, but however regarded the group of hardliners as very dangerous. According to the research, even those with moderate views, those titled to the western views could be dangerous, because they could turn against them one day. They however expressed relative comfort with such group, as they could be controlled. For the orthodox, according to the research, they could also be prone to a change of view. As for the hardliners, it further observed, not only that they are dangerous, they should be left as such. A corresponding hard line view should be evolved that could benefit the western world. They therefore created religious groups. In Nigeria they could not find a group to do the dirty job and therefore decided to do it themselves by creating Boko Haram. Boko Harama does not exist, they are the (real) Boko Haram. In some places, they found volunteers who could do the dirty job. Other people are doing it without actually knowing that they are working for them. Whatever one did that benefited the West and protected its interest, they drafted him to do it on their behalf. The imposed insecurity in this country has now superseded other problems. Problems associated with poverty, health, lack of portable drinking water, bad roads and school system are now minor and insignificant. The education system is so bad now that the military buy certificates in universities. Bunch of empty heads giving bunch of empty head soldiers certificates, because they have guns or can give out some money. Education system is killed, as universities can sell certificates to empty heads. With these prevailing situation, they (government) decided that our major problem is insecurity. On our part, we don’t know our enemy, we are being told that the Muslim is our enemy. We ask: Who does this so-called Muslim enemy kills? He kills the Muslims! This (so-called Muslim) enemy resides in Borno, Yobe and in forests in Zamafara, Katsina and Kaduna Birnin Gwari). We also observed that wherever the ‘Islamists’ resides, there abound rich resources. Wherever there is gold and oil, the ‘Islamists’ would be there causing mayhem. Who wants our gold and oil? Then you know for sure, they are those ‘Islamists’. They know where the real Islam is, this is why the attacked it. About six years ago, a blog by one Chidi Okpara, an online medium, wrote that they feared an Islamic revolution as the only stumbling block and threat to their access to oil (in Nigeria). They suggested collaborative effort of security operatives to annihilate the threat. Frankly speaking, we do not see insecurity as a problem, the people at the helm of affairs of government, who are not representing the people, are causing all these problems. As they could not blame themselves, they attribute it to a group. Don’t you see that when the late Emir of Kano Ado Bayero was attacked, the President went to condole the Emirate? He launched the attack. Similarly, when there was an attack on General Buhari, he extended condolence; he launched the attack. He did it! But what about us? Did he condole? (He could not) because, everyone knew he was behind it, while in the case of the other attacks it was not clear to the people he was behind it. He could not extend condolence over the atrocity he committed. He was behind all the attacks (and he knew it), and has been doing it all along. A lot of scholars and groups are constantly using the word ‘heresy’ (Shirk), ‘innovation’ (Bid’a), ‘Sunnah’, ‘disbelief’, etc to the extent that people have become confused. Can you briefly explain to us how these words are being used on pulpits, study circles and disseminated on CDs? These words are found in the holy Qur’an, and they have real interpretations. What you should know is that, our enemies are fighting us from within. Whoever focuses on promoting divisions among Muslims, whether he is called a Sheikh, Ustaz or renowned scholar, Emir, Sultan, whatever his social status or the many folds of his turban or robe, know that he is working for the enemies of Muslims. Any statement that distances or removes a group of Muslims from the fold of Islam, is the work of enemies of Muslims and Islam. Islam is simple; there is no deity worthy of worship, and Muhammad is the Messenger of Allah. Explanation can differ, but that does not remove a Muslim from the fold of Islam. Even if one among the Muslims has deviated, what do we call a deviant? When Prophet Muhammad brought the Qur’an, he was gentle with the people with courtesy. People are called to the truth and right path, not driven away and condemned to hell. He was victorious over Meccans with courtesy and good conduct. They fought him, but when he got an upper hand over them, they thought he was going to execute them, but he forgave them. For this, they clearly understood the Holy Prophet and the message. Some followed him but with hypocrisy, while others did not. He knew, but he went along with them. This is the real religion. Whoever want to practice the religion, he should copy the Holy Prophet. Those who distance or remove Muslims from the fold of Islam, what sort of religion are they practicing? Those creating and instituting hatred among Muslims are working for the enemies. Those groups and clerics calling themselves Sunni are opposing the struggle you are leading by referring to you as ‘Shi’a’. What is this Shi’a, and are you really Shi’a? These are words you can find in the Holy Qur’an, you will come across them as you read through. What some people have tried to do was to give anyone who did something a name, so that he becomes alienated and deserted. We are not the only victims of this. It happens even among themselves. The moment one sees the other having a lengthier turban, he gives him a name. Like the words ‘heresy’ (Shirk) and ‘disbelief’ (Kufr), which you (earlier) mentioned, the words ‘Shia’ and ‘Sunnah’ also have meaning. We have schools of thought in Islam, and they differ in way of understanding. There is what is called ‘Shi’a’ and there is what is called ‘Sunnah’. They should however be placed in their right perspectives. Sunnah has many definitions. It is referred to any act that is not obligatory; it also connotes any (approved) action of the Prophet. Sunnah can also mean those group of people that hold the belief that the Prophet did not leave behind a will. According to them, the Prophet died without assigning a guide after him, but allowed the people to choose for themselves a leader. This is where the difference comes in. On the other hand, the Shi’a believe that the Prophet left behind a will with clear nomination of his heir, one after another up to the end of time through Allah’s command. With these two schools of though, if you are a committed Muslim, you should study books of the two schools, choose what is right and discard what is not right. This is what we are doing in every school of thought. We take and discard from both Shi’a and Sunnah schools of thought. Religion is an activity, not just a name. Should a man build a hospital and name it, Good Hospital, does that makes it good? If a wood cutter calls himself Professor, does he really becomes a Professor? The 2015 election is approaching. Though you do not believe in the system, but what message do you have, as there could be better ones among the bad? In the first place, Muslims should know what is before them. They should realize that Allah’s message is a trust given to them, which should be fulfilled by following the dictates of Allah. People talk a lot, but the talking does not correspond with their actions. They should be ambassadors of the religion, so that others will see the religion in them (in good light). A Reverend came here and said, if he could really see the religion in the Muslims, he will accept it, that he waits to see the real religion (manifest) in the Muslims. I was surprised. Now people talk a lot, but they are found wanting in terms of action, or they practice it (religion) in bits. Regarding election, there had been elections in the past since the military handed over power. It had been imposition since the first election, when people were made to choose between two Olus (between Olusegun and Olu Falae). People were also prevented from forming their own political parties, and nominating candidates. Among the two Olus, one Olu was chosen for the people. That was not an election, but clear imposition. Before the chosen Olu left, he also imposed his own (candidate). We witnessed three elections in which had votes counted, surely Buhari had won elections three times. He was denied. It is known to all that leaders are imposed. When the imposition was taking place during the second election, I had an interview with late Adamu Yusuf of the BBC (may Allah repose his soul). I told him that, if what happened during the election was allowed to pass, there would never be (real) election in this country. This was because the situation was very clear; unpopular candidate was made winner of an election he lost. The trend continued. We will reach a situation when the election will not be held at all. Now they have the feeling that they cannot impose, this is why they are trying to plunge the country into chaos and anarchy at all costs by way of sporadic killings. What is before the people should not be election, as election did not bring to them the government of the day. It was a clear impositon, and he knows he was imposed on the people against their will. Do you think then, he will give people the freedom to choose someone who will dislodge him? He will definitely impose himself. It is left for the people to know this. On our part, we already known where we are heading; let those in darkness also realize this and pick the way.